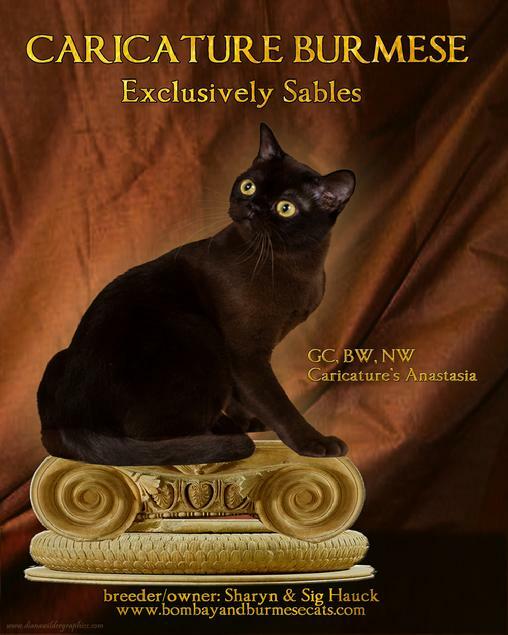 Caricature is delighted to present our CFA National Winning Sable Burmese cat, GC, BW, NW Caricature's Anastasia. 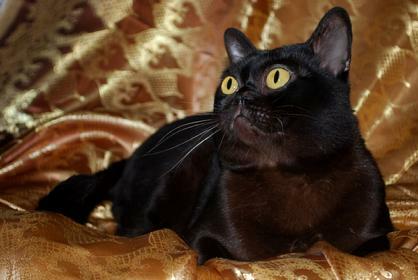 'Stash' is the daughter of Remy Martin, with lovely golden eyes, a sleek sable body, and the sunny Burmese disposition. Malala scampered through the season as a kitten, charming everyone with her wide golden eyes and her antics on the judging table. She achieved a regional win, and is now all grown up and competing as a Grand Champion. Caricature's First Burmese Grand of Distinction! Caricature is delighted to present GPD, RW Caricature's Patrick Brown, our first Burmese Grand of Distinction. Patrick, owned and showed by Robin Rommel, is the son of GC, GP RW Caricature's Donatella. 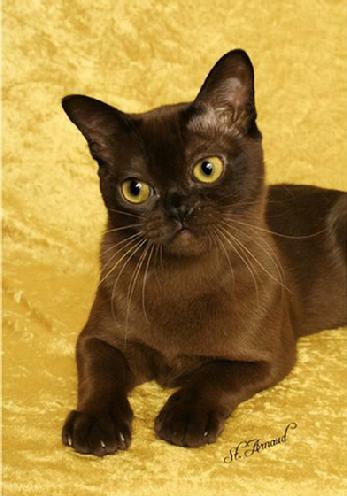 A Grand of Distinction (GPD, or GCD) is a cat that has achieved thirty or more top ten or top fifteen finals in three separate years. This award requires excellence in the cat, and good humor in both cat and owner. We are delighted with Patrick and with Robin! The First Bombay Grand of Distinction! <?xml:namespace prefix = o ns = "urn:schemas-microsoft-com:office:office" />On April 30, 2004, GC, BW, NW Caricature's Colin Powell, a male <?xml:namespace prefix = st1 ns = "urn:schemas-microsoft-com:office:smarttags" />Bombay, son of GC RW Caricature's Isaac Hayes, DM and CH Caricature's Jamaica Kincaid, DM ended the show year as the highest scoring cat in the Cat Fanciers Association. 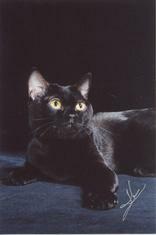 Colin was the CFA�s "Cat of the Year", and the first Bombay to attain the Cat Fanciers Association highest award, "Best Cat!" Following his successful show career, Colin spent a short period at home insuring his legacy. His first offspring were born on the Fourth of July, 2004. 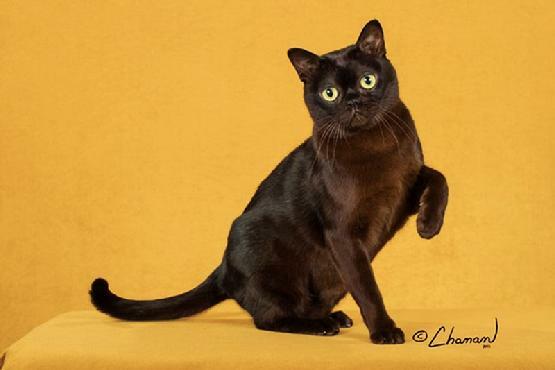 Colin is now neutered and living in the lap of luxury, as well as the laps of his owners, in Florida with a couple of other Caricature Bombay former show-stoppers and now pets. 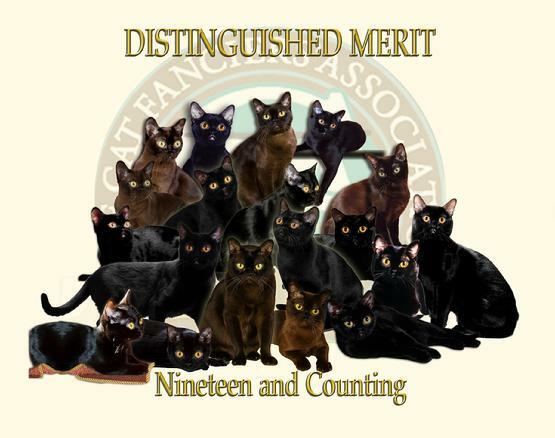 The Cat Fanciers Association gives special recognition to females that produce at least five Grand Champion offspring and Males that produce fifteen Grand Champions. 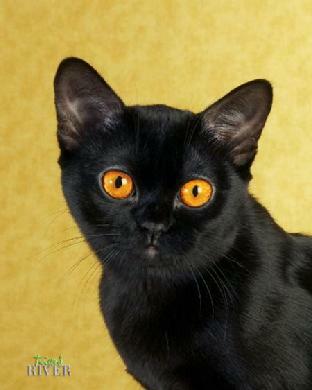 This recognition is given by adding the letters "DM" (Distinguished Merit) to the end of a cat's official name. This honor is considered by to be the true sign of a successful breeding program. Producing consistency in a breeding program is most rewarding and a truly difficult undertaking. Caricature Cattery, which has sought to achieve the best in beauty, disposition and health, has achieved a total of eighteen "DMs" in its history so far. 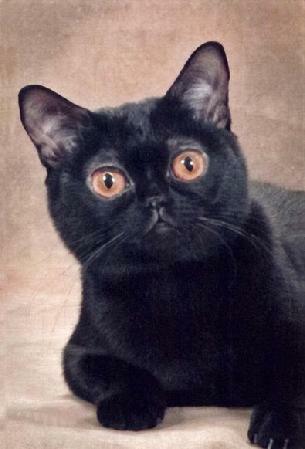 We are pleased and proud to announce that GC Caricature's Alice Walker, DM, is the fifth in an unbroken line of Distinguished Merit cats descending through the female line. This line started with GC Bijouxcats' Rosa Parks, DM, and has continued down through Sojourner Truth to Sonya Sanchez to Zora Neal Hurston and now Alice Walker. This achievement of consistency and overall quality is a true accomplishment. 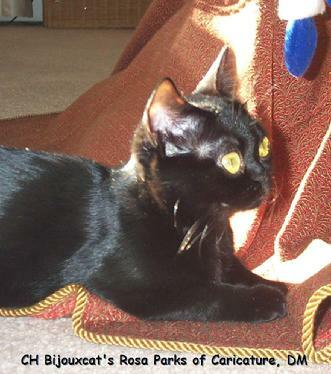 Alice has passed on her beautiful eyes and wonderful personality to her kittens, many of whom romp through our home even now. GC, NW Caricature's Marian Anderson delighted the Cat Fancy with her beauty and charm as the first national-winning Bombay kitten. In the winter of 2009 her fifth kitten became a 'Grand', giving his mother the prestigious title of 'Distinguished Merit', making her GC, NW Caricature's Marian Anderson, DM. GC Caricature's Nina Simone, DM, is the daughter of GC, BW, NW Caricature's Colin Powell and GC Caricature's Beyonce Knowles, DM. Like Marian Anderson and Zora Neale Hurston, she is the fourth in an unbroken line of Distinguished Merit cats through her mother. 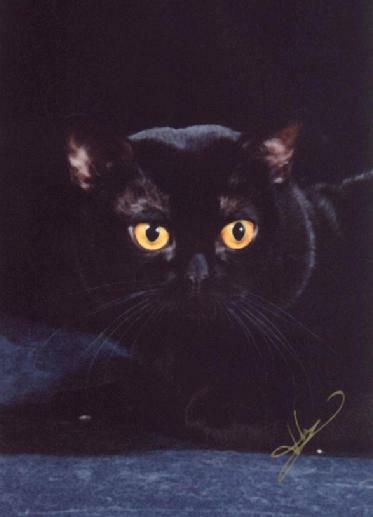 Nina is Canada's first Bombay Distinguished Merit cat, and Caricature Cattery is proud to congratulate Nina's son, GC, BW, NW Star Academy Oliver Jones, Canada's first Bombay National Winner in the Cat Fancier's Association. 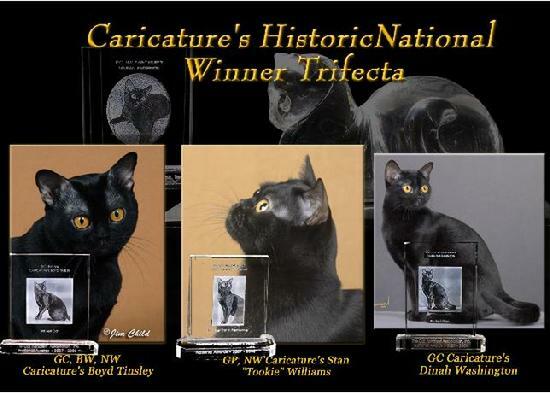 GC Caricature's Zora Neale Hurston, DM, the daughter of GC, BW, NW Caricature's Colin Powell and GC Caricature's Sonya Sanchez, DM, is the fourth in a line of Distinguished Merit cats on the female line. No, they are not contacts! They are the naturally hypnotizing headlights of GC Caricature's Beyonce Knowles, DM, another of Caricature's delightfully darling female "DMs." 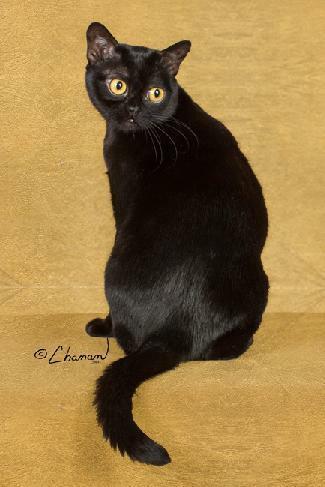 CH, GP Sangazure Patina of Caricature, DM - our first Burmese DM! 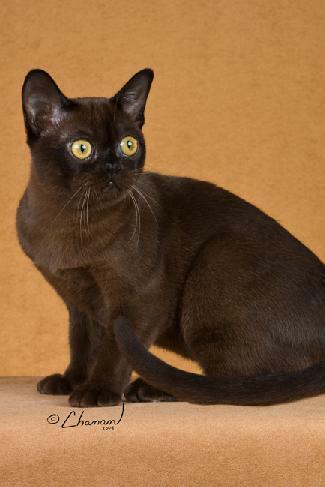 Caricature Cattery's First Sable Burmese DM! 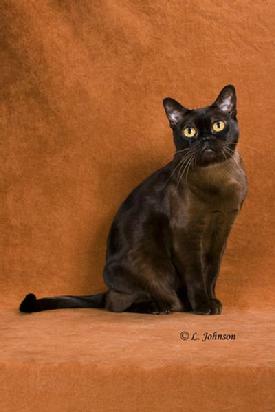 GP, CH Sangazure Patina of Caricature, DM, a Sable Burmese, joined the ranks of Caricature's Distinguished Merit winners in 2007. 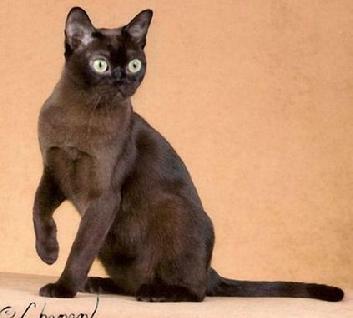 She is the sixth Caricature breeding cat to receive a DM title by producing five or more Caricature Grand Champion offspring - and she produced them in only two litters! The mother of Donato, Karishma and Frida, seen on these pages, Patina is happily retired in Rhode Island, ruling the roost with one of her sons and two Caricature Bombays. GC, RW Caricature's Sonya Sanchez, DM **** PRODUCED FOUR GRAND CHAMPIONS IN ONE LITTER! On February 26, 2005, Caricature's Audra McDonald became a Grand Premier. In doing so, she became the fifth Grand for her Dam, GC, RW, Caricature's Sonya Sanchez - AND the fifteenth Grand for her Sire, GC, RW Caricature's Isaac Hayes. CFA Allbreed Judge Lois Jensen provided Audra with the final award that resulted in the additional prestigious titles for all three cats. Sojourner Truth and Jamaica Kincaid also attained "DM" recognition during the 2004-2005 CFA show season. Truth is now living with a pet care-giver in CT.
GC Caricature's Jamaica Kincaid, DM, who gave birth to GC, BW, NW Caricature's Colin Powell (see above - this page) and GC Caricature's Moses Gunn of Lac Hong (see- Cattery News page) is now the best girl friend of a traveling nurse who takes Jamaica with her wherever she goes, saying that Jamaica provides her with stability and continuity in her busy, changing life. 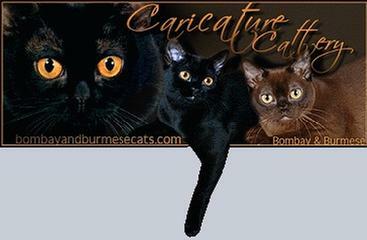 During the 2003-2004 season, One of Caricature's foundation Dams, Bijouxcat's Rosa Parks of Caricature, became the first of Caricature Cattery's "DMs." 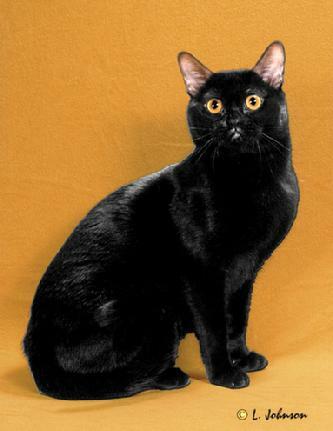 Rosa is the Dam of two other Caricature's "DMs," Isaac Hayes (below - on this page) sire of Colin, CFA's first Bombay "Best Cat," (see above - on this page), and Sojourner Truth. Rosa now lives in Queens, NY, devoted to her owner who is devoted to working with older foster children for the City of New York. 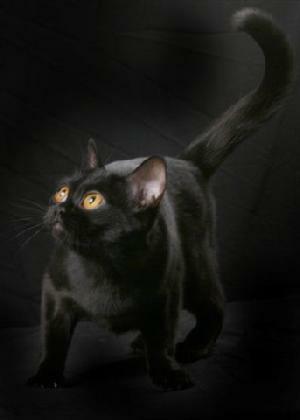 CFA's First National Winning Bombay Kitten! GC NW Caricature's Marian Anderson established another first in the Cat Fanciers' Association when she became the first Bombay kitten to ever attain a National Win !! 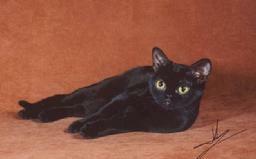 She finished her kitten career in September 2005, became a Grand Champion in one show, and is now a DM (see below). Another CFA First for Caricature Cattery - The First CFA Bombay Trifecta! 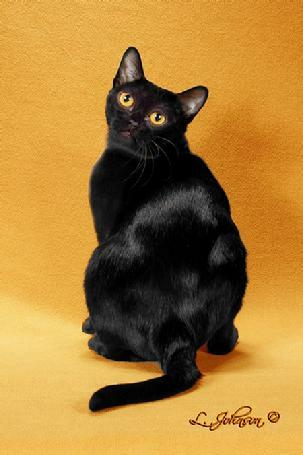 The 2007 - 2008 show season saw another Bombay first for Caricature Cattery � the first Bombay �Trifecta� � when a single cattery produces a National Winner in each of the CFA divisions - Championship (unaltered adult cats), Kittens (cats under eight months of age) and Premiership (altered adult cats). This was only the fourth time in over a century of CFA history that any cattery has achieved this distinction. 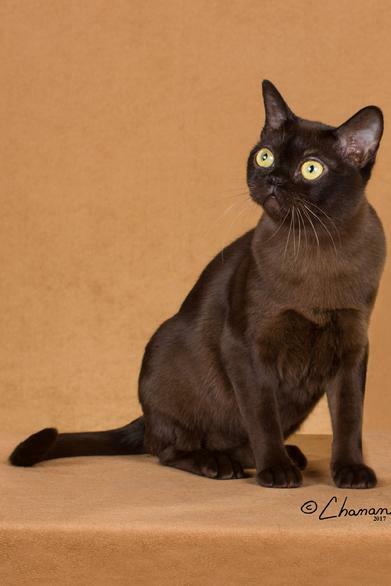 This is the latest of several accomplishments that have highlighted the commitment that Caricature Cattery has to the preservation and promotion of the Bombay breed. GC Caricature's Karishma was the second best Sable Burmese globally in 2007. 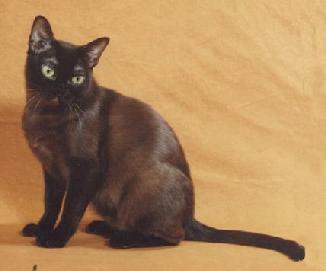 GC Aung San Suu Kyi, DM is our second sable Burmese DM, and the first bred by Caricature. The mother, with Donato, of many of our beautiful Burmese, Suu Kyi quietly manages the household and the cattery, getting things done to her satisfaction without fuss, truly the iron paw in the velvet glove. Everyone loves her, and she loves everyone, from kittens to new, nursing mothers. She scampers through our house and makes us smile, and some of her kittens - Donatella, Orlando and Shakira - are on these pages. Happily retired now, she's with us in her forever home. 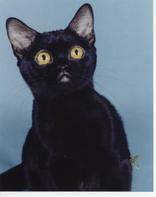 GC, RW Caricature's Shakira, DM is our third Burmese Distinguished Merit cat. The daughter of Suu Kyi and Donato, she inherited their wonderful personalities and has passed her engaging, affectionate nature and beauty to her kittens. She has graced our home with her beauty, personality and charm, and gifted us with beautiful, affectionate and healthy kittens - and now she has achieved the 'Distinguished Merit' designation, the most prestigious accomplishment that a breeder can hope for. Caricature is pleasedto announce two more of their cats have joined the roster of Distinguished Merit cats. Both are male - a male DM is one who has sired fifteen 'grand' (Grand Champion or Grand Premier) offspring. This is a rare and wonderful accomplishment. Please join us in celebrating Anzo and Donato, our newest DMs. GC. BW, RW Lac Hong Anzo of Caricature, DM, is the grandson of our first male DM, GC, RW Caricature's Isaac Hayes, DM. Anzo's father, GC Caricature's Moses Gunn, went to Paris with a fine breeder of Burmese and Bombays. 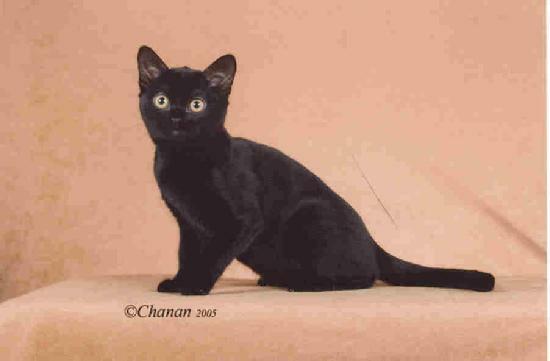 She brought Anzo to us, and he charmed us with his wonderful personality, and with the beautiful kittens from him. 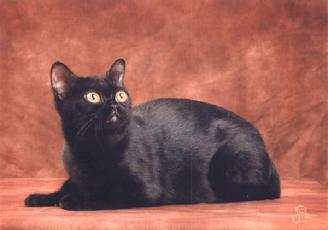 He is now happily retired, with one of his kittens, in the southern United States. GC Caricature's Donato Bramante, DM is the son of GC, GP Sangazure's Patina of Caricature, DM and the father of GC, RW Caricature's Shakira, DM (whose mother is GC Caricature's Aung San Suu Kyi, DM). He is a beautiful package of silky sable happiness, delighted to meet people and be fussed over. 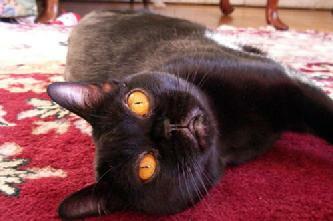 And he has passed his wonderful personality and loving disposition on to his kittens. 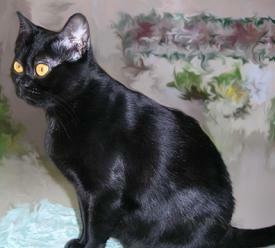 GC Caricature's Siduri, DM is our latest Distinguished Merit cat, passed to her kittens her beauty, dispostion and charm. GC Caricature's Gypsy Rose Lee, DM, is already featured on our pages. Her lovely personality was passed on to her kittens. And in March of 2016 she became our latest Distinguished Merit cat.